Experience the thrill of Sailing and the Comfort of Cruising onboard Habibi. Good Food, Good Fun & Plenty of it! is our motto on Habibi where you will experience a fun filled 2 days and 2 nights live-aboard cruise and enjoy activities such as sailing, snorkelling, exploring pristine inlets and bays, relaxing on Whitehaven Beach. Good food is our passion and you will enjoy freshly prepared gourmet meals & social evenings under the southern stars. Habibi caters mainly for the 18-35 year old budget backpacker market who are seeking fun and adventure at half the price of some other charters. 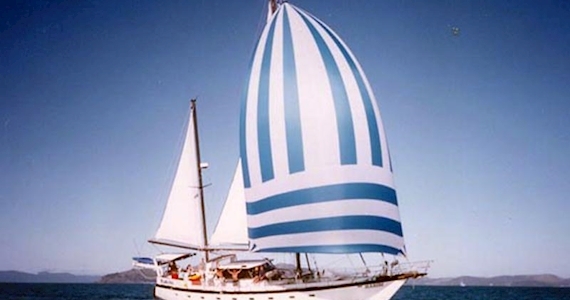 Habibi is renowned as one of the best value for money charter boats in the Whitsundays. She is a fast sailing 18 metre steel ketch, comfortable and stylish, with craftsman built features. Habibi is spacious above and below deck, and is beautifully fitted with exotic timbers. With private double and twin cabins, permanent shaded areas and heaps of deck room for sunbaking & sleeping under the stars. It’s the Crew that makes the difference….